Philips today announced the slimline Philips SA9345 portable audio/video player, which weighs just 48g and measures 9cm long. 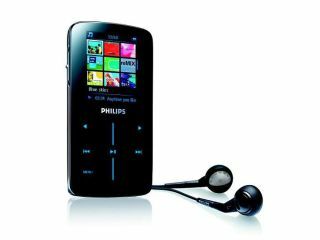 With 4GB of flash memory, the Philips SA9345 can hold up to 1,000 MP3 tracks or 2,000 WMA songs. Alternatively, it'll hold up to 1,120 photos or seven hours of WMV content, which you'll be able to enjoy on the 1.8-inch colour LCD screen. You can access your music, videos and photos using the touch-sensitive screen interface which is sensitive to finger taps, drags and swipes. Philips has redesigned the interface to show icons rather than text information, and you'll be able to search your music according to genre, artist, playlist and even album artwork. The Philips SA9345 supports 8-320Kbps and VBR MP3 bit rates, 32-192Kbps WMA audio bit rates and 320 x 240 resolution WMV9 content at up to 348Kbps shot at 30 frames per second. Other video formats are supported using the supplied converter software. The player syncs with Microsoft Windows Media Player and transfers files from PCs via USB2, making it very easy to put new tunes onto the player. Battery life is said to last for 10 hours of continuous music playback and up to two hours of non-stop video enjoyment. There's also an integrated FM radio. The Philips SA9345 is available in a 2GB version (the Philips SA9325) as well. Both models are on sale now for £129 and £99 respectively.